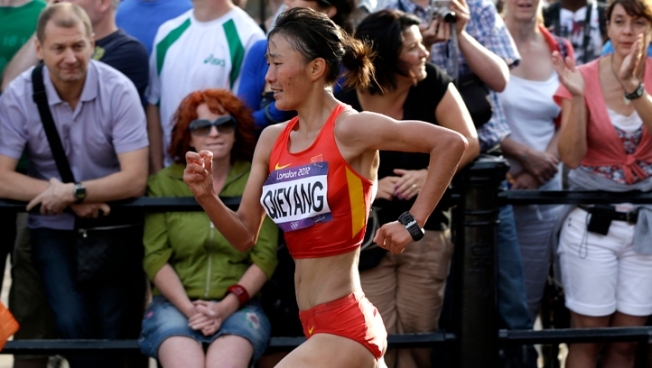 China's Qieyang Shenjie competes in the women's 20-kilometer race walk at the 2012 Summer Olympics. Qieyang won the bronze medal. On any other day and in any other situation, the Tibetan exiles who gathered excitedly in groups next to Buckingham Palace would never have come to cheer for an athlete wearing the colors of China, a country they regard as their oppressor, a country that invaded and has governed their Himalayan homeland with an iron fist for six decades. But this was exceptional. Because, apparently for the first time at an Olympics, the athlete was one of them, a Tibetan. Standing apart but, just this once, both wanting the same thing, groups of Chinese supporters shouted "Jia You!" while the Tibetans yelled "Gyuk!" — both meaning, "Go on!" The Chinese waved their red flags. The Tibetans waved the flag of Tibet that is banned in China, with a bright yellow sun rising over a snow-clad mountain. They could hear and see each other, but they studiously ignored each other, too. The athlete — Qieyang Shenjie to the Chinese, Choeyang Kyi for the Tibetans — could hear the yells of encouragement. But she kept her head down and concentrated on not putting a foot wrong. It seemed a fitting metaphor for a Tibetan competing for China, one smart enough not to get sucked into the politics that have swirled around her Olympic participation. Not only did Qieyang make history for Tibetans, she won a medal, too — bronze in the women's 20-kilometer race walk Saturday. She beamed when she crossed the finish line, a picture of delight. If she felt discomfort at all as a Tibetan in Chinese colors, she didn't show it. "I'm extremely honored to take part as the first representative of the Tibetans at the Olympic Games and to win a medal," she said. She said she heard Tibetans encouraging her along the route that went past the residence of Queen Elizabeth II. "I heard it! Really. I heard a Tibetan cheering me on. At the time, I looked backward but couldn't see who that person was," she said. But she looked alarmed when asked if she saw the Tibetan flags, shaking her head and refusing to answer. Because Tibet is ruled by China, it does not have its own team or athletes at the Olympics or other international competitions, like the football World Cup. So, for Tibetans, this was the first time they'd been able to cheer on one of their own. But it also was a shock to some of them to see Qieyang striding past them in Chinese red. "Am I really cheering for Tibet or China?" wondered Ugyen Choephell, who said his parents fled Tibet in the 1960s to India, where he was born. Still, he yelled "Choeyang Gyuk!" and was thrilled when she went past. "Great, really. Very emotional," he said. "History in the making." If there was another Tibetan at previous Olympics, history has forgotten them. In China, the government-run Xinhua News Agency and other media said Qieyang was the first Tibetan to make a Chinese Olympic team. Olympic historian Bill Mallon said Tibet has never fielded an Olympic team and that he and other Olympic experts he consulted weren't aware of any previous Tibetan Olympian. The Tibetan government in exile in India said likewise. "As an individual, we wish her well," said Dicki Choyang, the exiled administration's minister for information and international relations. "She must have put in a lot of effort to reach there. But we are sad that she cannot represent a free Tibet." "China uses things like this for their political gain. The fact that a Tibetan is participating in the Olympics does not take away anything from the dire situation prevailing inside Tibet," Choyang added. Qieyang, 21, said she was born in what is now the Chinese province of Qinghai and that her family are Tibetan herders, although she was stumped when asked how many animals they have. "I can't remember. I haven't been home for many years," she said. She seemed something of a curiosity to reporters from China who peppered her with questions after the race, won by Russian Elena Lashmanova. They asked Qieyang for a Tibetan song. She refused. She told them her Tibetan name means "the sun," that she started running as a kid, that she said a Buddhist prayer before the race and that her family isn't well off. On the blog she keeps, Qieyang said she was sworn in as a member of China's ruling Communist Party in July before coming to London to compete. "Will be making a swear-in speech. A bit excited and a bit nervous," she wrote. That drew a range of responses from other Chinese bloggers, from those who called her "disgusting" and questioning why she wanted "to join the world's biggest mafia?" and was "boarding the wrong boat" to others who wrote "congrats," ''impressive," ''very good." She sounded embarrassed when asked why she joined — again, clearly trying not to put a foot wrong. "Why? I ... I ... How to say? It's all good," she said. If Qieyang was keeping her real feelings to herself — and it was impossible to know — Tibetans who turned out in support found it hard to believe that she might be happy competing for China, even though she certainly seemed to be. "For her, I can understand it's a difficult situation. I imagine that the Chinese have given her threats of all sorts. I would think she is brainwashed or forced to do this. There's not much choice for Tibetans in Tibet," said Yangchen Kikhang, a Tibetan born in India. "As an individual, we are proud of her, but that she is representing China, I'm not happy," she said. Still, she cheered Qieyang and consoled herself with this thought. "Inside her head," she said, "she probably thinks she is Tibetan."